Imagine if these two gentlemen had been painting side-by-side (they did meet in Paris, but never worked together) on a lovely day, in the French countryside (my painting, ‘Country Road, PEI’, substitutes for rural, 19 century France). Van Gogh’s paintings have fetched some of the highest prices for art; but he had sold only one painting during his lifetime (for a relative pittance). Unfortunately, he had difficulty garnering attention and respect for his work and never realized financial gain prior to his death in 1890 (self inflicted gunshot, or not). Monet, on the other hand, had become somewhat of a sensation by 1886 (when this fictitious “en plein air” meeting would have taken place). His paintings were fetching handsome prices by then, allowing him to finally enjoy a very comfortable lifestyle, up until his own passing in 1926. What would have been the tone of their conversation? I have added my suggestion below. And what do you think they would say to one another? Go ahead, add your own caption. 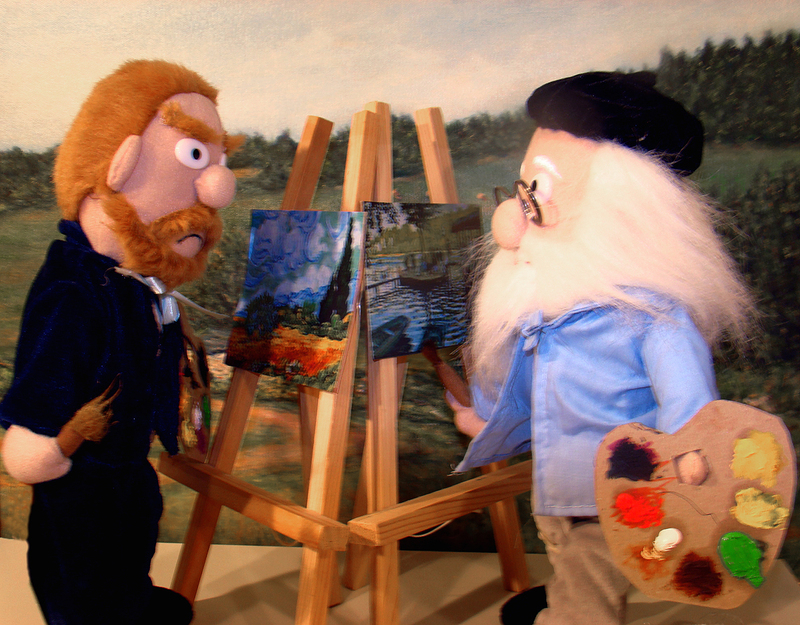 Van Gogh: “Bloody hell! You get 200 francs for that? Hrmph!